The offline digital forms for Android and iOS goes a step further. 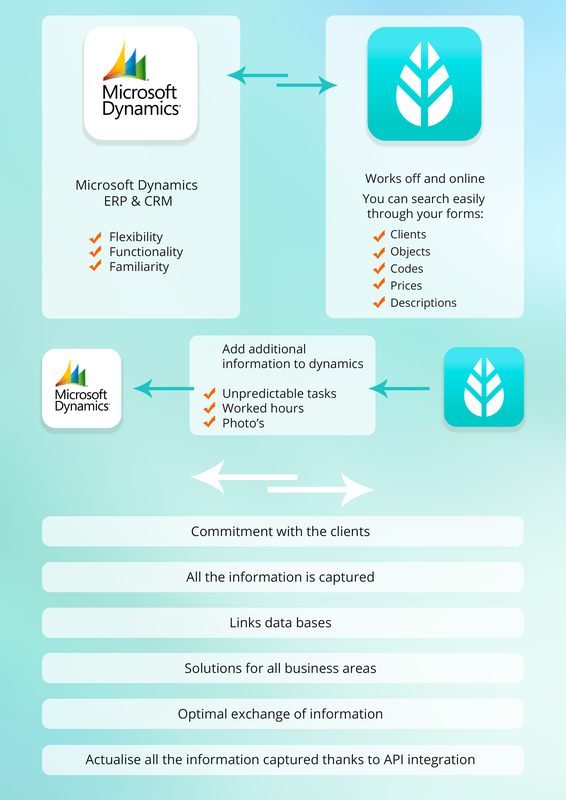 Do you want to know how the MoreApp integration with Microsoft Dynamics works? It is a fact that MoreApp and Microsoft Dynamics can work together through an integration. But do you know Microsoft Dynamics? It is CRM and ERP software that is designed for small and medium business, and it is sold by its partners network within different industries which supply specialised services. This CRM has flexibility, familiarity and a lot of functionality; giving solutions to all business areas, from Marketing to Sales Support. Microsoft Dynamics is the solution in order to improve the business process and provide better management. The objective is to achieve a bigger commitment with clients, improving current relationships and creating new ones with possible clients, thanks to offering helpful solutions and personalised services. All partners distributing Microsoft Dynamics can link client databases, codes, price information etc. directly from the digital forms through a webservice. Moreover, the information captured in the forms, can be actualised at Dynamics thanks to the API documentation. In that way, you can exchange data from your digital forms with your workers in an optimum way using MoreApp, which is available for Android and iOS. Do you want to try MoreApp? Sign up here for free!